The picture on the left is by the Spanish artist Goya: engraving number 76 from his series Los Caprichos, published in 1799. The picture on the right is a fairly typical cover from the pulp magazine The Shadow (this one is from 15 June 1933). 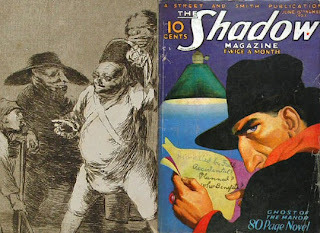 The Shadow was an American crime-fighter of the depression era ... so the question is, what was he doing in eighteenth century Spain?